The Buns Are In The Oven. Thank you, thank you, thank you, thank you, thank you for ALL of your prayers! Everything went absolutely perfectly today. I was super-duper calm and peaceful. Praise the Lord! Our two embryos thawed wonderfully. 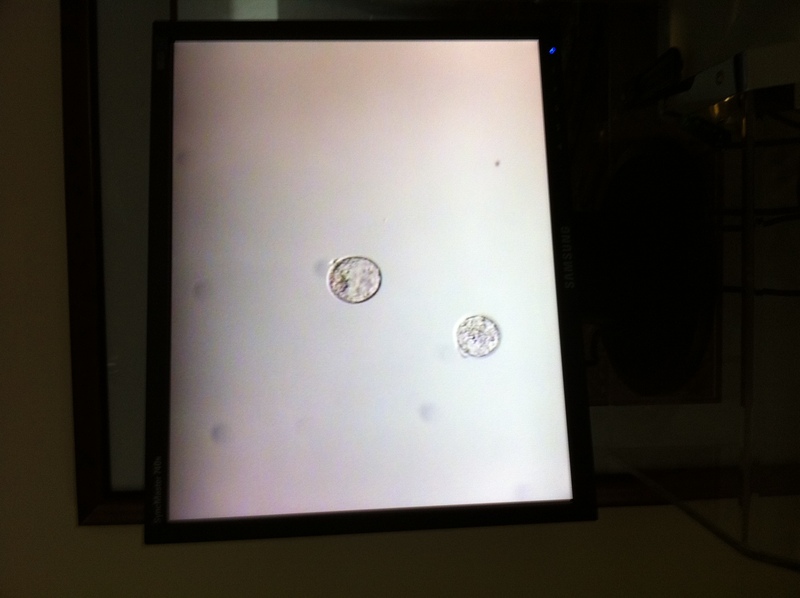 So wonderfully that the embryologist said they didn’t even look like they had ever been frozen! Both came back with 100% of the cells they had before they were frozen. Praise the Lord! Just before the actual transfer, they showed us a magnified image of them while they were still in the incubator right there next to my bed. Trav took a pic with my phone. We’re now back at our hotel and I’m on bed-rest for the remainder of today and all day tomorrow and tomorrow night. We’ll be able to head back to KC. So, the waiting continues to see if everything “sticks”. I’ll go in for blood-work in a couple of weeks for a pregnancy test. ***Note*** Trav just informed me that I posted the pic sideways. You get the idea, right?? That is awesome!! I will be praying for you guys!! I’m so happy for ya’ll! yay!!! i hope the weeks fly by until the test. take it easy! That is amazing! I have been thinking about you all day! So glad all went great. So excited for you! Still praying! Hooray!!! Can’t wait to hear more good news! Will be praying and waiting to hear from you!! Love you!! awww, those are the cutest embryos i’ve ever seen. i love that you have a picture of those perfect little creations! Aww…it’s like their first baby pictures! So happy and excited for you guys. I will pray that everything continues to go as smoothly as they are. Covering you in prayer! Can’t wait to hear the next report!! Sweet girl we are praying for you like crazy!!!! I think I heard a lilting melody in your voice. :D I, myself am squealing!! I love you, all. By the way, they look just like each other! i wish i could hug those embryos. praying, praying, praying! and smiling at the adorables pictured! so exciting. bless you, bless you, bless you…..love you so much. as everything has gone perfectly so far…believing for perfection the rest of the way. hugs.